For the last six weeks I've taken a break from blogging. What, you may ask, have I been doing all this time? I've been breathing. Not breathing AND bicycling, or breathing AND talking, or breathing AND walking. My respiratory adventures began in eastern Thailand, where I spent a month at a monastery called Wat Pah Nanachat, which translates to “International Forest Monastery.” International because the monks at this monastery come from all over the world, and English is the common language spoken. 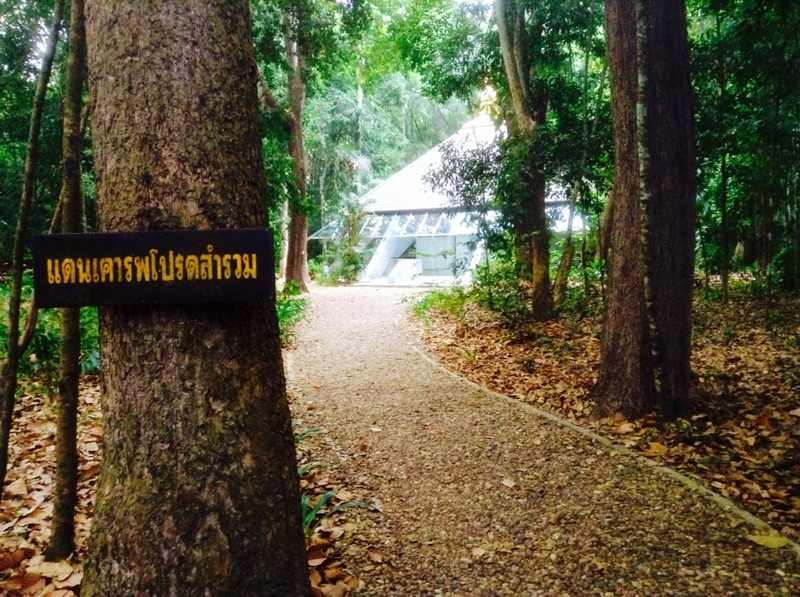 Forest, because this monastery belongs to the “forest” school of Theravada Buddhism, which tries to replicate the ascetic lifestyle lived by the historical Buddha. Imagine a bunch of white guys in saffron robes, living an extremely simple life in the forest, and you've got the idea. 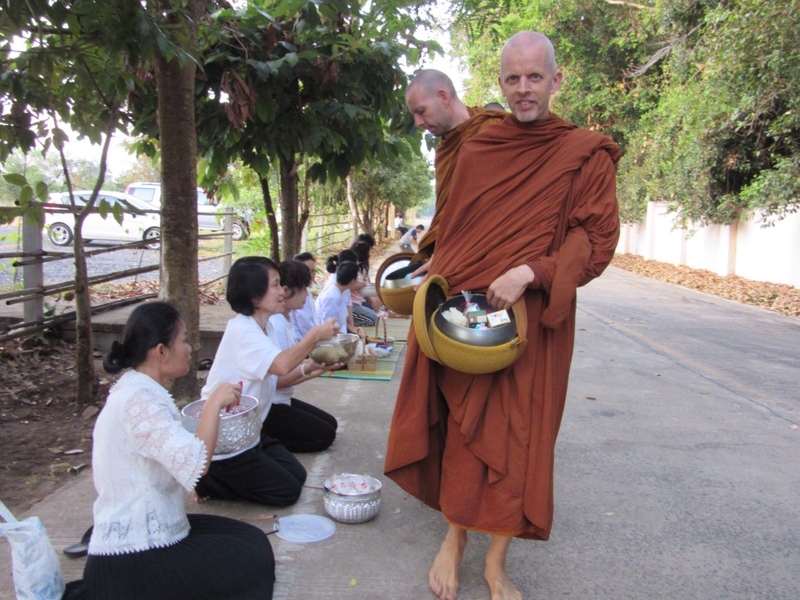 So what's it like to spend a month at a Buddhist monastery? Imagine being so bored, for so long, that finally your boredom itself becomes interesting. Your boredom, your irritation, your restlessness, your escapism, your fantasies of chocolate milkshakes and hot showers. You'll notice how one mosquito buzzing in your ear can turn you into a raging lunatic. Or how the abbot droning on and on with his sermon, while the only food you'll eat for the next 24 hours is getting cold and gelatinous on the table, will make you become so judgmental, so HANGRY, that you're amazed you haven't actually murdered anyone yet. When there is no escape from what annoys you, and no way to satisfy your cravings, you will have nothing else to do but watch. And watch. And WATCH. Watch all the feelings and thoughts and fantasies and memories and delusions come and go. You will realize what a a total headcase you actually are. And just when you think you really ARE going to throttle the abbot, or sneak off to the nearby 7-11 for an iced coffee and a snickers, you will remember to breathe. You will take a few breaths, and then you will realize that you're okay, that actually nothing is wrong, that its all just your mind doing backflips like a bored monkey in a cage. You will let it go. You will slow down. Your limbs will hang loose, your muscles finally surrendering their death grip on whatever it was they were holding onto. You will discover that you are actually looking forward to raking leaves at 5:30 am. You will be so awed by the beauty of a treefrog in the sink or a sunrise filtering through the forest canopy that you will scarcely be able to breathe past the lump in your throat. You will cry over the memory of a childhood pet. You will cry over nothing. You will realize that you can totally manage on one meal a day, and that you don't have to freak out when ants are crawling all over your leg. You will just be still, and they will move on. And you will never, ever, EVER eat something as delicious as the double-sausage egg mcmuffin that you devour as soon as you leave. (Although you will blame your new friend from the monastery, after all it was HER idea it was to stop at McDonald's, you would never ever do that yourself.) After that you will devour the green curry, the pad thai, and ice cream sundae, and all the different street foods whose names you don't know. After you have stuffed yourself, and slept in a proper bed, and stuffed yourself some more, and consumed caffeine and alcohol and the internet, and even bought yourself a cute new shirt at the night market, you will feel strangely dissatisfied. You will realize that you're not actually happier or more content than you were at the monastery. You're just moving again. After leaving the monastery, I didn't really know what to do with myself. Luckily, I didn't have a choice. 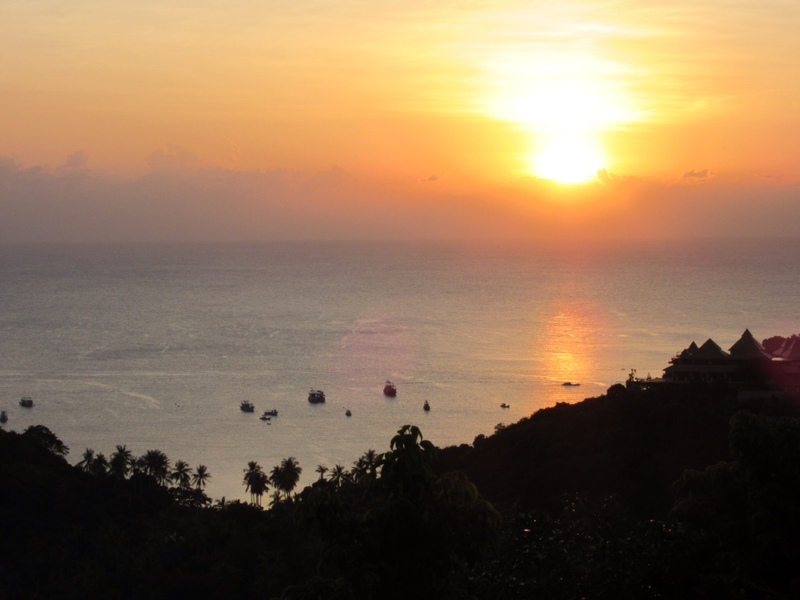 I was going to Ko Tao, an island in the Gulf of Thailand that is thick with partying backpackers, snorkeling honeymooners, and sunburned snowbirds from Sweden and Germany and Minnesota. 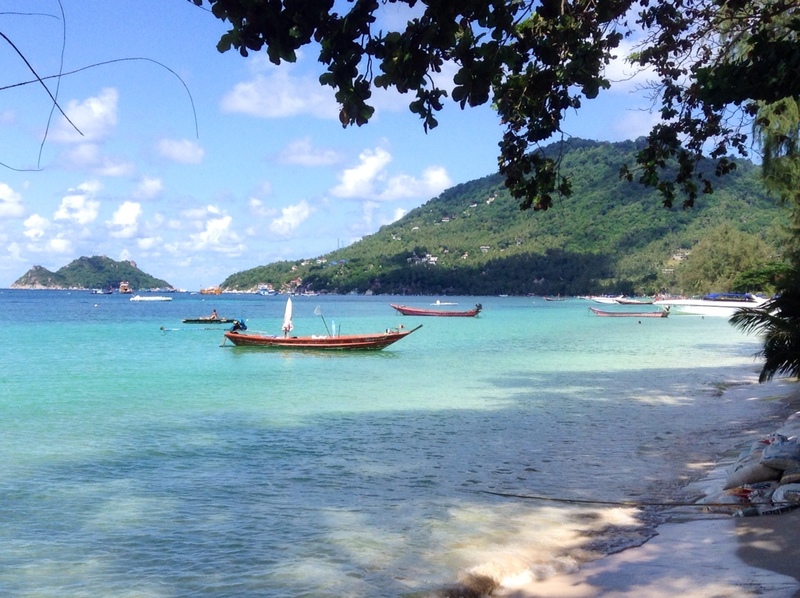 I had booked a bungalow on Ko Tao months in advance, as a splurge for the final weeks of my trip. While I was a bit skeptical about what it would be like to suddenly join the throngs of heat-seeking tourists, the bungalow was already paid for. 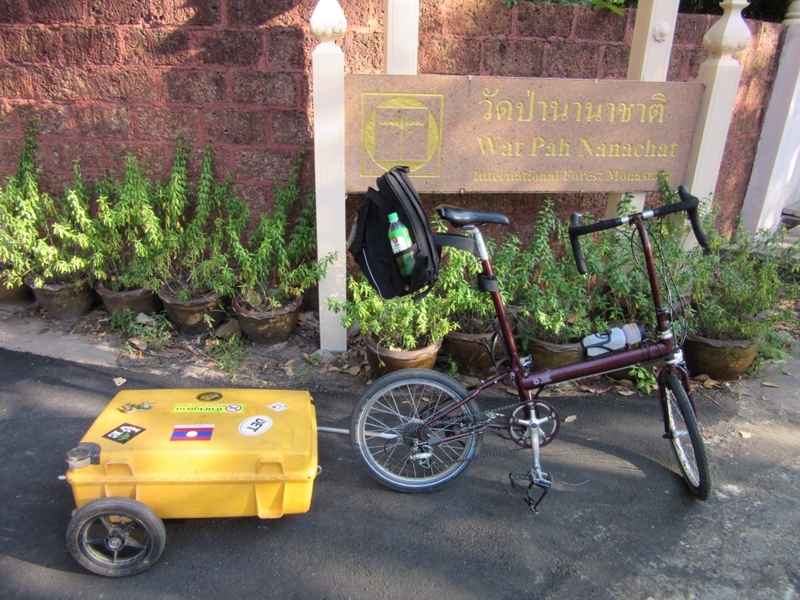 So I packed up the bike and, after a brief stopover in Bangkok, made my way south. Scuba has never appealed to me for the very reason that it seems so artificial and stuff-intensive. But using the breath to explore hidden depths? I'd never heard of such a thing, but it sounded like a metaphor for my time at the monastery. And it also seemed like a good way to escape the crowds while discovering what had made Ko Tao so popular in the first place. Thus began the next phase of my lessons in breathing. After arriving on Ko Tao I signed up for a two-day course at a school called Apnea Total, where I learned breathing techniques to oxygenate the blood, loosen the diaphragm and calm the mind for diving. When it finally came time to try some deep dives in the ocean, I was surprised by how not scary it was. I expected to find myself a panicky mess when I dove under, but instead I encountered a rare serenity there in the deep blue. In my fins, wetsuit and mask, I glided easily through the clear blue depth, listening to the gentle hum of the ocean. By the end of the class I was diving 40 feet below the surface, and feeling more comfortable in the ocean than I ever had before. I wanted more, but the next day a storm blew in and brought a halt to all nautical pursuits for the next three days — and then it was time to get off the island, to begin the long journey toward home. Hi Ricka, wow, what a small world! I didn’t meet your brother but I’ll bet some of the monks at the monastery know him. I am glad to know you were having some solitude and silence adventures, can’t wait to learn more.